The Bureau of Reclamation will host the 2019 operations meeting for the Dolores Project on Thursday, April 18, at 7 p.m. The meeting will be held at the Dolores Community Center, 400 Riverside Avenue in Dolores, Colorado. “This meeting is a great opportunity for our partners and the public to find out how the 2019 water year is shaping up and to have any related questions answered,” said Western Colorado Area Office Manager Ed Warner. 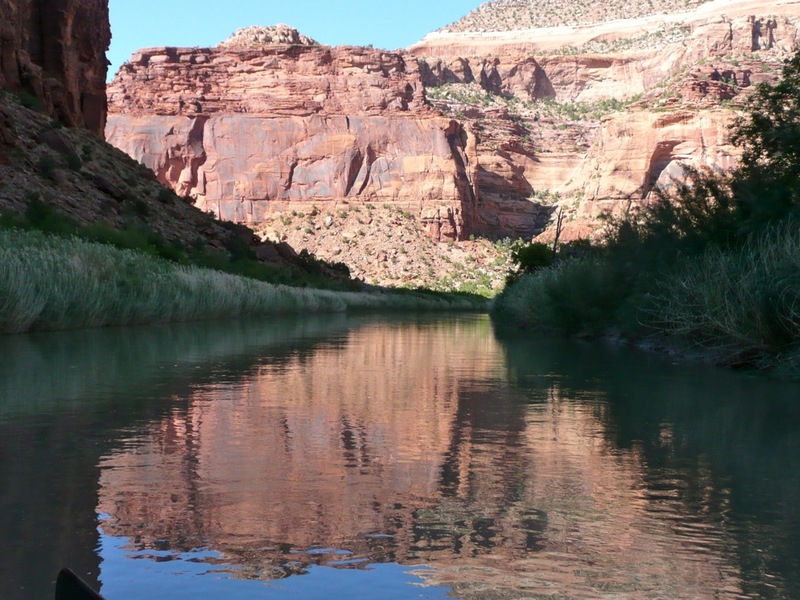 Meeting topics will include a review of 2018 operations, projected water supplies and runoff for 2019 and the forecasted possibility of a boatable release to the Dolores River below McPhee Dam in 2019. The meeting will also include presentations and representation from several agencies, including: Reclamation, Bureau of Land Management, United States Forest Service, Dolores Water Conservancy District, Colorado Parks and Wildlife, Dolores River Boating Advocates, American Whitewater and Fort Lewis College. There will be opportunities for questions, comments, and discussion during the meeting. For more information, please contact Robert Stump at 970-565-7232 or rstump@usbr.gov. 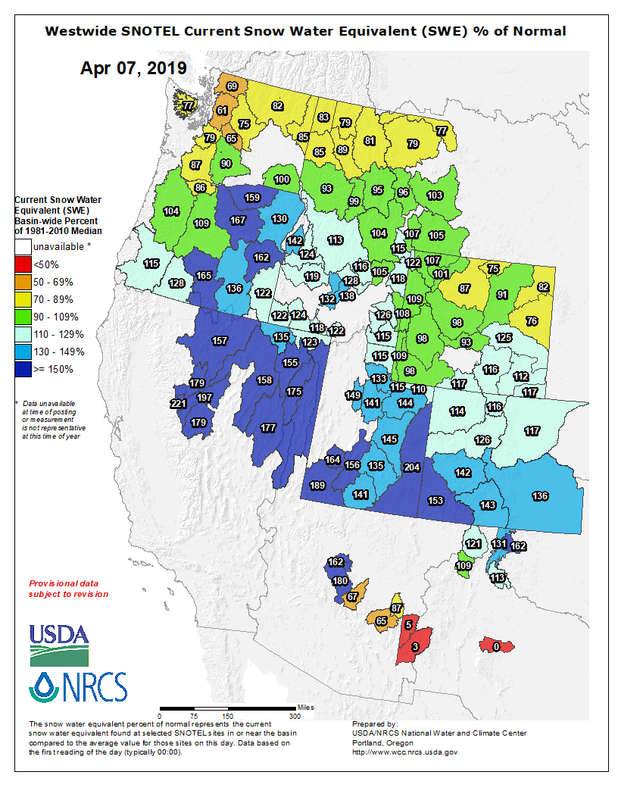 Westwide SNOTEL basin-filled map April 7, 2019 via the NRCS. [Tim Miller] envisions Ruedi Reservoir filling during the first half of July, likely around July 4. The reclamation bureau and two other agencies have forecast the amount of water flowing into the reservoir this year at 120 percent to 140 percent of average for April through July. Miller said one thing that stands out this year is the lower elevation snowpack is so big in the Fryingpan Valley. The Kiln snow telemetry site, at 9,600 feet in elevation, was at 147 percent of median on Thursday. The reservoir was at about 55 percent full. While that isn’t a historically low level, it is 10,000 acre feet lower than at this point last year and at this point in 2011, Miller said. Having the extra space compared to the big runoff year of 2011 is reassuring, he said. Governor Jared Polis this week signed a bill to help prevent water pollution from future hardrock mining operations in Colorado. Rep. Dylan Roberts, whose district was impacted by the 2015 Gold King Mine spill near Silverton, co-sponsored the bill with Rep. Barbara McLachlan. 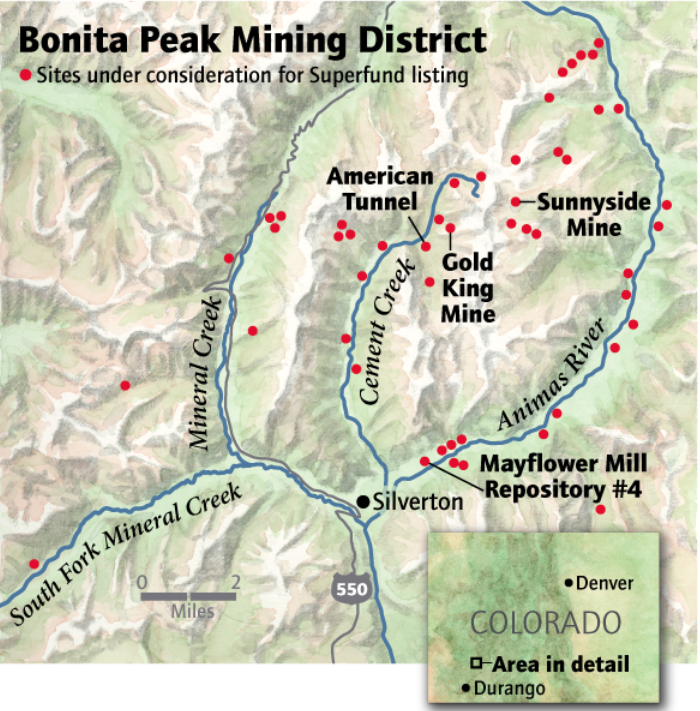 Mining operations have polluted more than 1,600 miles of Colorado rivers and streams, according to the release, and Colorado is one of just seven that allow “self-bonding,” which allows mines to operate with insufficient recoverable assets, leaving taxpayers vulnerable to potential cleanup costs. Numerous small business owners, rafting outfitters, farmers, local elected officials and others from across western and southern Colorado testified at a House hearing in support of the bill. It passed both the House and Senate with bipartisan support.